Nowadays Rwanda has been making news for an entirely different reason, making us rethink what we thought we knew about this country. There are many reasons why we should stop associating the country with just its history of genocide, and rather look at the changes the country has gone through within such a short amount of time. Here are THREE main reasons why I personally think Rwanda could be as cool and badass as the Wakanda we all dream of seeing. 1) Plastics bags are illegal. Since 2008, Rwanda has implemented the law of banning the use of non-biodegradable polythene bags. Rwandans are using paper, cloth, and other materials as an alternative for plastics bags,enabling its capital, Kigali, to become one of the cleanest cities in Africa while preserving the environment at the same time. Inbound travelers are stopped at the airport for security checks for plastic bags! 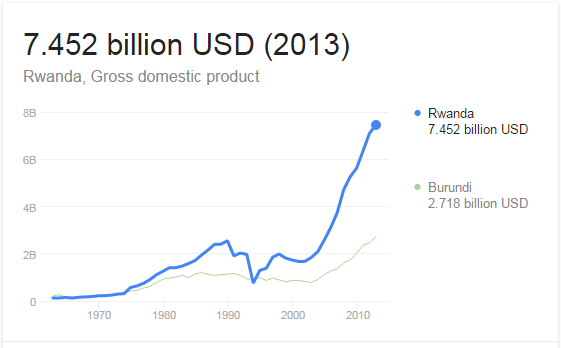 Since 2006, Rwanda has become one of the fastest growing economies in Africa with an 8% rise in GDP per capita. In 2016, Rwanda was ranked the 2nd best country to do business in Africa and on the global scale, it ranked 45th out of 196 countries. 3) Gender Equality is REAAAL. The Global Gender Gap Ranking for 2017 showed that Rwanda places 4th in the world when it comes to gender equality. Iceland placed 1st, Norway 2nd, and Finland in the 3rd. 61.3% of the parliament is made up of female representatives, and more than 80% of the women are in labor force. There are pro-women laws like three months of paid maternity and the narrow wage gap between men and women. Female empowerment, a strong economy, and environmental preservation. If this does not feel like Wakanda, I don't know where else does?! Fun Fact: Rwanda is one of three countries in Africa(Uganda and Democratic Republic of Congo) where you can see Mountain Gorillas, an endangered species of Gorilla, once assumed to be extinct.